Apple announced its AirPower wireless charging mat at its September 2017 iPhone event. The mat is capable of charging an iPhone, Apple Watch and AirPods case all at the same time. The mat never was launched in 2018 and many suspected it may have been cancelled altogether, as Apple’s website removed references to the product. 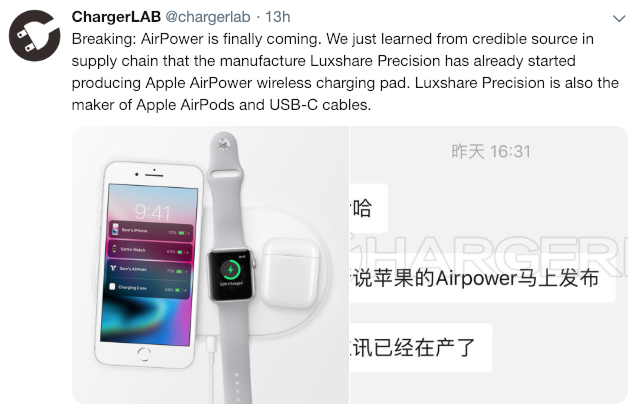 Now, it appears reports of AirPower’s death have been greatly exaggerated, as Hong Kong-based ChargerLAB claims sources note production has started, by Luxshare Precision, the same manufacturer of Apple’s AirPods. Breaking: AirPower is finally coming. We just learned from credible source in supply chain that the manufacture Luxshare Precision has already started producing Apple AirPower wireless charging pad. Luxshare Precision is also the maker of Apple AirPods and USB-C cables. Apple AirPower: Another source claims Pegatron is set to start mass produce AirPower at Jan 21. Pegatron is also an Apple OEM in Asia. The company employee says AirPower has total three layers of coils in 8-7-7 configuration from bottom to top. Back in October, Apple analyst Ming-Chi Kuo released a research note saying AirPower could still launch, in “late 4Q18 or early 1Q19”, along with new AirPods as well. Last spring, ChargerLAB claimed Apple’s 2018 iPhones could come with a 18w USB-C power adapter, but that turned out to be incorrect, as the charger was actually meant for 2018 iPad Pros. If AirPower is actually starting production soon, expect more leaks to come to further confirm this rumour, from Apple’s supply chain. Many peg AirPower to cost around $149 USD, or about $200 Canadian. Are you still holding out for AirPower to wirelessly charge all your Apple devices? If it were to launch soon, a new wireless AirPods charging case release at the same time would be fitting as well.